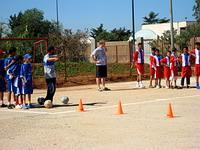 Volunteers can work as sports coaches and assistants for various schools in the area. While soccer is the most popular sport in Morocco, we also have opportunities for those interested in basketball to get involved. We've been celebrating the success of our first volunteer on this placement who arrived earlier this month from the sunny skies of St. Louis. We know the soccer and basketball teams around Rabat will greatly benefit from the help of our volunteers. Continue to keep an eye on this project and hopefully you'll be seeing the Michael Jordan's of Morocco emerging soon!